"To assist a child we must provide him with an environment which will enable him to develop freely"
Thank you for your interest in #1 Montessori School in Spring, Texas. At Blossoms Montessori School, each child is provided a rich and individualized curriculum in a safe, stable environment that enables them to develop self-confidence, inner discipline, and a love of learning. The love and dedication of our committed staff in imparting knowledge to the children makes our school’s environment conducive to learning. We welcome the opportunity to meet and further discuss with you the child care programs that are offered at Blossoms Montessori School during the school tour. We trust that you will find the Blossoms Montessori to be a warm and inviting learning community. We look forward to meeting you! We welcome the opportunity to meet and discuss with you further the many program offerings available at Blossoms during a school tour. We trust that you will find the Blossoms Montessori to be a warm and inviting learning community. We look forward to meeting you! The steps in our admissions process include:Schedule a Tour: Contact the Admissions Coordinator to schedule a tour. This is a great opportunity to learn more about the Montessori educational philosophy, see the students in their classroom and ask questions. Complete an Application: Applications are accepted year-round. Submit an application form along with a non-refundable registration fee. Admission Acknowledgement (based on availability and appropriate placement): If a placement is offered, families will be notified by email. Additional forms including health forms, immunization record, emergency card, tuition and policies agreement will be provided at this time. 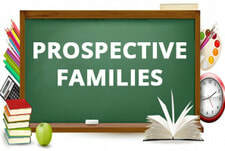 Introduction Meeting with Classroom Teacher: After availability has been determined, families are contacted to schedule an individual introduction meeting with their child’s teacher. Q. Does Blossoms Montessori School offer Scholarships? A. Yes, Blossoms Montessori School offers Scholarships to the students. Please contact front desk for more details. Q. Is Montessori for all children? Can Montessori accommodate gifted children and what about children with other special learning needs? A. The Montessori approach has been successful with all, infants up to adolescents from all socioeconomic levels, those who are academically gifted or have learning differences and/or are physically impaired. Because of its individual approach, Montessori education is uniquely suited to educate children of differing needs, temperaments and abilities. An advantage of the Montessori approach is the multi-age classrooms with students of varying abilities and interests that allow each child to work at his own pace. Students whose strengths and interests propel them to higher levels of learning can find intellectual challenge without being separated from their peers. The same is true for students who may need extra guidance and support: each can progress through the curriculum at his own comfortable pace, without feeling the pressure to "catch up." We might note that from a Montessori perspective, every child is considered gifted, each in his own way. Every child has his own unique strengths—it is all a matter of degree. Q. Why is the Montessori approach beneficial to children? A. Dr. Montessori realized that children’s play is their work—their effort to master their own bodies and environment—and out of respect, she used the term “work” to describe all their classroom activities. Montessori students work hard, but they don’t experience it as drudgery; rather, it’s an expression of their natural curiosity and desire to learn. The goal of Montessori education is multi-faceted: it encourages self-discipline, self-knowledge and independence; it nurtures a curiosity that results in a lifelong love of learning, and it provides an organized and developmentally appropriate approach to problem solving and academic skill development. Q. How does Blossoms Montessori School differ from other schools? The child possesses unusual sensitivity and mental abilities for absorbing and learning from his or her environment that are unlike those of the adult both in quality and capacity. The most important years of growth are the first nine years of life when unconscious learning is gradually brought to the conscious level. The child has a deep love and need for purposeful work. He or she works, however, not as an adult for profit and completion of a job, but for the sake of the activity itself. It is the activity which accomplishes the most important goal of the child: the development of him or herself, inclusive of mental, physical, and psychological powers. At Blossoms Montessori school we work within the premises of Montessori education providing the environment and experiences for the development of physical, psychological and intellectual abilities. Blossoms Montessori school fosters students with the necessary skills they will need to succeed in higher levels of education and in life too. Independence is fostered in our Montessori classrooms. We believe that children do not learn best in rigid and unstructured environment.. We therefore provide an exciting and enriching environment with structured activities where students are free to explore, analyze, discuss and learn at their own comfortable pace. When children are independent to make choices they are motivated to learn and are likely to succeed. His freedom of choice and decision is limited to the materials and structured activities related to the curriculum in the environment. Children set personal goals and once they succeed they gain leadership qualities by helping their younger classmates to succeed. The Montessori didactic materials have built-in control of error. Repeatedly working with these materials develops critical thinking in the child that enables him to correct himself without adult’s help. The Montessori equipment and prepared lessons are presented to the children in a manner that fosters critical thinking, another skill needed to prepare him to face challenges in life. Children are naturally curious. They are born with a very own desire to learn and develop themselves. Our Montessori environment encourages their curiosity and allows children to study and practice subjects that interest them with as much freedom as possible. The ability to set one’s own pace is perhaps the greatest benefit of a Montessori education. If children need extra time and assistance to work with a topic they can and in subjects where they excel, they may complete the basics and try out more complicated experiments. Q. How can children learn if they're free to do whatever they want? A. The child is free to move about the classroom, to talk to other children, to work with any equipment or material whose purpose he or she understands, or to ask the teacher to introduce a new material. The teacher observes the child, noting his or her needs and interests. Dr. Montessori observed that children are more motivated to learn when working on something of their own choice. A Montessori student may choose his focus of learning on any given day, but his decision is limited by the materials and activities—in each area of the curriculum—that his teacher has prepared and presented to him. The teacher then uses his or her observations to facilitate learning by guiding the child toward those activities that will best serve his or her development. The child is not free to disturb other children at work or to misuse the equipment that is so important to his or her development. We call this attitude “freedom with discipline”. Q. If children work at their own pace, don't they fall behind? Q. What do the older students gain from a multi-age classroom? A. Curriculum in a multi-age setting is not static; older students can delve as far into a subject as they are able to, while younger students explore subjects at their own level. Older children serve as mentors and role model for the younger ones. Being in the multi-age environment they also “learn what they know” while gaining self-esteem in the role of mentor to the younger students and naturally develop leadership skills as they assist children of all ages. Q. Do Montessori teachers follow a curriculum? A. Montessori schools teach the same basic skills as traditional schools, and offer a rigorous academic program. Most of the subject areas are familiar—such as math, science, history, geography, and language—but they are presented through an integrated approach that brings separate strands of the curriculum together. While studying a subject the interrelatedness of all the things around the theme is well presented to the children making it more precise to understand the interdependency of the world around him. It also allows students to become thoroughly immersed in a topic—and to give their curiosity full rein. Q. At what ages does Blossoms Montessori School enroll? A. We enroll children from 12 months through kindergarten, ages 12 months to 6 years old. We will also offer before and after school care for ages 5-12 years. Q. I love your school and would like my child to join as soon as possible. What do I need? Q. What if someone other than a parent will pick up my child? A. Complete the pickup form that is located on the front desk for that day. The adult picking up your child will need to provide a valid photo ID. Anyone you place on the authorized pick up list on your child’s emergency card has your permission to pick your child up at any time. Q. If my child is sent home with a fever, may I bring my child back the next day? A. No. Your child must be free of fever, without fever-reducing medication (ex: Tylenol), for 24 hours before returning to school. Q. How well do Montessori students do compared to students in Traditional schools? A. There is a well-designed research comparing Montessori students to those in traditional schools. These suggest that in academic subjects, Montessori students perform as well as or better than their non-Montessori peers. Q. How will my child make the transition from a Montessori classroom to a traditional classroom? A. Montessori children are unusually adaptable. Since they have been given encouraged to make decisions at an early age they develop self-discipline and independence. Montessori programs, based on, self-directed, noncompetitive activities, help children develop strong self-images and the confidence to face challenges and change with optimism. Furthermore in a Montessori environment children develop the foundational ability to approach learning in a variety of ways. Q. I would like to visit your school. Do I need to schedule a tour? A. We encourage all the parents to schedule a visit to get a campus tour and discuss the learning opportunities available at Blossoms Montessori School. You can make appointment by calling _____ . Q. I would like to know my child’s progress. Can I talk to the teacher? A. Yes, you can set an appointment to have a conference with the teacher. Leave a message with the director or office staff and they will call you to schedule a meeting. Q. Can I bring my child late to school? A. You may, but children arriving after the classes start (8:30 AM) will miss significant classroom instruction. Progress in academic as well as other areas can suffer. Q. What exactly is Montessori? A. Early in the twentieth century, Dr. Maria Montessori, Italy’s first woman physician, developed educational philosophy, materials and methods based on her scientific observations of young children’s behavior. Dr. Montessori’s study about the learning process of children brought her to the conclusion that children teach themselves based on what they find in their environment. Her developed philosophy, methods, and materials eventually became known as the Montessori approach of education. The Montessori Method of Scientific pedagogy encourages self-discipline, independence, academic skills, problem solving ability, and an enthusiasm for learning.